We have returned to the “States” and want to thank you for the outstanding golf package you put together for Jerry and Darlene, Linda and myself. 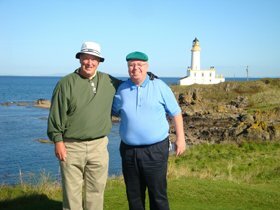 We started at Turnberry (probably the most beautiful golf course I have ever played), moved on to Gleneagles, St. Andrews Old and Carnoustie. The golf, caddies and courses were better than we could have hoped. We even experienced both good and wet conditions playing – I don’t know how you did that! Thanks for the great work you did putting this package together. Another item off our “bucket list”.